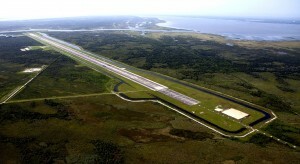 NASA’s Kennedy Space Center in Florida is undergoing renovations to transform it into a multi-user spaceport. In the process, many of the historic buildings will be demolished and replaced with more efficient alternatives. One of Space Shuttle Program’s more iconic elements, the Mate-Demate Device (MDD), was demolished in late 2014 so that the facility could be converted for use by industry partners in the new age of private spaceflight. Demolition began in Oct. and was completed on Nov. 26. 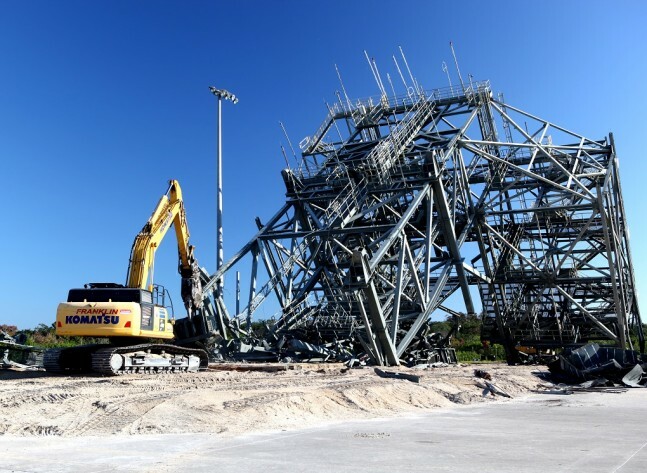 The primary contractor for the demolition was V&R/Sunrise Systems of Brevard, Inc. Frank-Lin Services, Inc., of Melbourne, Florida, a subcontractor. On Oct. 24, 2014, an employee of Frank-Lin Excavating Inc. uses a cutting torch to prepare support beam girders on the Mate-Demate Device in preparation for demolition. Many shuttle missions ended at Kennedy Space Center’s Shuttle Landing Facility (SLF), but when the turbulent Florida weather did not cooperate, the orbiter could also land at Edwards Air Force Base in California. There, at NASA’s Dryden Research Center, a twin MDD would lift the orbiter from the runway and secure it to the 747 Shuttle Carrier Aircraft (SCA). 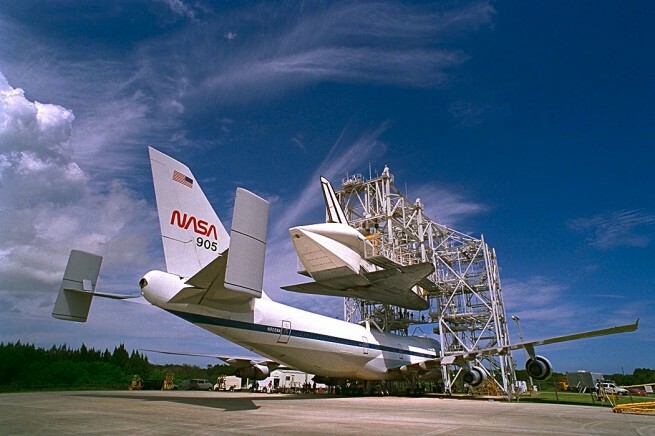 The SCA would then fly the orbiter to KSC where the MDD would lift it from the back of the 747 and place it on the runway to be towed to the Orbiter Processing Facility (OPF). The MMD was located at the northeast corner of the ramp to the SLF. Towering at a height of 105 feet, it measured 150 feet long and 93 feet wide. It was designed to lift 230,000 pounds. Standing on the Atlantic coast, it was engineered to withstand hurricane-force winds of up to 125 miles per hour. The orbiter was lifted by a lift beam mounted at the 80-foot level. 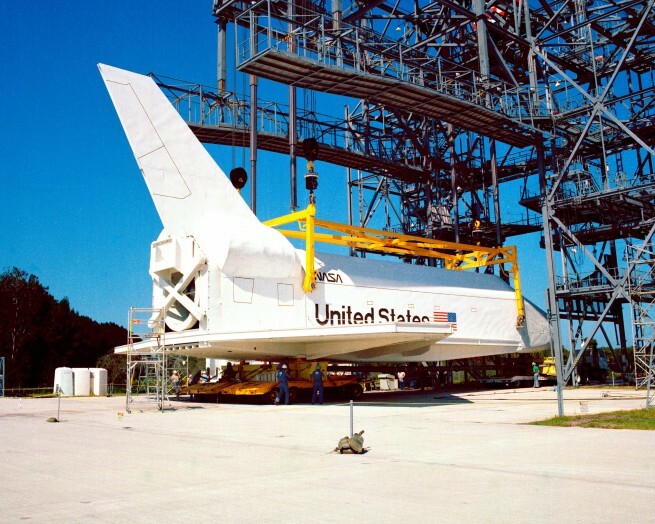 KSC’s MMD was first used on Oct. 19, 1978, when the shuttle mockup Pathfinder was mated to it for a fit test. But it got a lot of use in the early Shuttle era. In those early days, the orbiters landed not on a concrete runway, but on Rogers Dry Lake at Edwards. The one exception was STS-3, when Space Shuttle Columbia landed at White Sands, New Mexico on March 30, 1982. There, a huge crane called the Stiffleg Derrick lifted Columbia onto the 747 and the MMD lifted it upon the 747’s arrival at KSC. The first landing of an orbiter on a concrete runway was on Oct. 26, 1977, when the Space Shuttle Enterprise flew its fifth Approach and Landing Test (ALT) flight and landed on runway 04. But the first time a shuttle landed on a concrete runway after a fly-in from space wasn’t until STS-4, the final test flight of the Space Shuttle Program. On July 4, 1982, Space Shuttle Columbia landed on runway 22. There, the Space Shuttle Challenger was waiting, already mated to the SCA. On the orders of President Ronald Reagan, the 747 took off from Edwards and transported the new Challenger to KSC. But it wasn’t until Feb. 11, 1984, when Challenger landed at the Shuttle Landing Facility for the first time, that the MDD was not needed after a shuttle flight. In July on 2011 the Space Shuttle Program came to an end with STS-135 as Space Shuttle Atlantis touched down for the last time. The MDD’s last use was on Sept. 14, 2012, when Endeavour was mated to the SCA for transport to its final home at the California Science Center in Los Angeles. The steel beams were broken apart for recycling. “Altogether, we recycled about 844,700 pounds of steel, tin and aluminum from the MDD,” Otero said. The first use of the MDM took place on Oct. 19, 1978. A space shuttle mock-up, dubbed Pathfinder, is attached to the crane fixture for at fit-check. The mock-up had the same general dimensions, weight and balance of an actual space shuttle. With the end of the Space Shuttle Program, Kennedy Space Center is transferring its facilities to support private spaceflight. The SLF is used by Zero Gravity Corporation, which takes passengers on flights where they can experience brief periods of microgravity. It has also been used by NASCAR for vehicle testing. In 2013, the SLF was turned over to Space Florida, Florida’s aerospace economic development agency, for commercial flights.